As I study God's kingdom program I am struck by the importance of Gen 1:26-28. I often don't see this passage brought up in discussions of the kingdom of God or millennium. But its importance is front and center for the kingdom issue and we all should wrestle with its implications. Here we are told that man is made in the "image" and "likeness" of God. To be made in the image and likeness of God means that man is a son and a king. He is like God in some ways (although not God), and he represents God. As one made in the image of God, man is a king and vice-regent tasked by God to rule over God's "very good" creation (Gen 1:31). Some have called this task the "cultural mandate." Others refer to it as the "creation mandate." I like to call it the "kingdom mandate." God the ultimate King tasks man as a vice-regent and king to rule over the realm of His creation. This passage has kingdom fingerprints all over it. There are many truths found in Gen 1:26-28 and we cannot survey them all here. But we do see one very important thing. The primary task of man is to rule and subdue the earth for God's glory. We know that with the Fall of Genesis 3 man not only died in his relationship with God, he utterly failed the kingdom mandate. Instead of man successfully ruling from and over the realm of earth, the cursed ground would now frustrate him with thorns and thistles and eventually swallow him up in death. Even to this day we experience the turmoil of a creation that often works against man bringing disaster and death. Man certainly has successes at times with technological and medical innovations but is far from having a successful reign over the planet. In fact sinful man often uses his ingenuity for purposes that are harmful to both people and nature. We are hard pressed to claim that mankind is fulfilling the rule and subdue mandate successfully. It is not happening today. Yet You have made him a little lower than God, And You crown him with glory and majesty! You make him to rule over the works of Your hands; You have put all things under his feet, All sheep and oxen, And also the beasts of the field, The birds of the heavens and the fish of the sea, Whatever passes through the paths of the seas. Note the kingly terms used of man—"crown," "glory," "majesty," and "rule." And it is directed to the realm of God's creation on the earth. 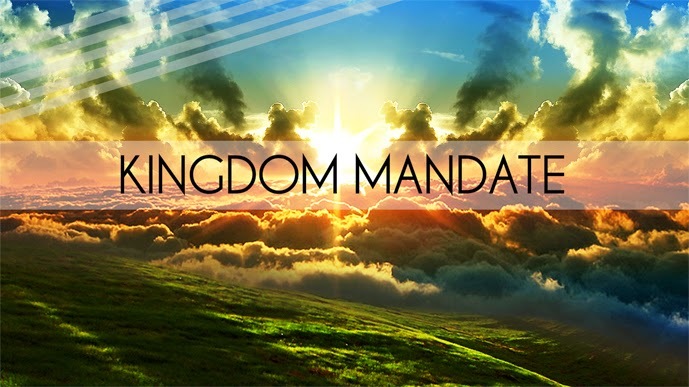 This shows that although man failed the kingdom mandate with his rebellion in Genesis 3, the mandate to rule and subdue the earth has never been revoked. Hebrews 2:5-8 also quotes Psalm 8 indicating that man's right to rule is still in force. The one caveat, though, is this truth—"For in subjecting all things to him, He left nothing that is not subject to him. But now we do not yet see all things subjected to him" (Heb 2:8b). Thus, man still has the right to rule but as of yet, we are not seeing this fulfilled—"we do not yet see all things subjected to him." This directs our attention to the future. The successful reign of man from the earth over the earth is still to come. In fact, in Heb 2:5, the writer refers to the "world to come." Man's successful reign and fulfillment of the Gen 1:26-28 mandate awaits a coming world. then comes the end, when He hands over the kingdom to the God and Father, when He has abolished all rule and all authority and power. For He must reign until He has put all His enemies under His feet. The last enemy that will be abolished is death. For He has put all things in subjection under His feet. But when He says, "All things are put in subjection," it is evident that He is excepted who put all things in subjection to Him. When all things are subjected to Him, then the Son Himself also will be subjected to the One who subjected all things to Him, so that God may be all in all. Note a few things here. First, verse 27 quotes Psalm 8 which shows that subjection of the world is in Paul's mind. Thus, there is an earthly focus to this reign of Jesus. Second, Jesus is the ultimate Man who fulfills the kingdom mandate. Sinful man could not fulfill it, but Jesus the perfect "Last Adam" (see 1 Cor 15:45) can and will fulfill it. Third, we see that Jesus "must reign." It is God's plan for Jesus the Son and Messiah to have an extended visible reign upon the earth. This must be the case since God wants and expects the kingdom mandate of Gen 1:26-28 to be fulfilled successfully and it has not occurred yet. Note also Psalm 2:6 where the Father says of the Messiah, "I have installed My King upon Zion, My holy mountain." Fourth, when Jesus completes this successful reign He then offers His kingdom up to God the Father and subjects himself to the Father (1 Cor 15:24, 28). At this point the eternal kingdom of the Father becomes the focus. Thus, when we examine 1 Cor 15:24-28, we see a successful reign of Jesus the Messiah from and over the realm of earth where the first Adam (and all of us) failed miserably. This successful reign begins at the time of Jesus's second coming (see Matt 19:28; 25:31; Acts 3:20-21). The cross of Christ is the basis for the reconciliation of all things (see Col 1:20), but the reign of Jesus the Messiah over the earth awaits the future. Another point is key as well. When Jesus reigns over the earth, those who belong to Him will reign with Him. The saints share in His reign! In Rev 5:9-10 we are told that believers from all ethnic groups who are saved by Jesus' blood "will reign upon the earth." As Jesus reigns on the earth, those who have believed in Him will do so as well. So not only does Jesus the ultimate Man rule over the earth successfully, he shares His reign with those who identify with Him. This is affirmed in Rev 2:26-27 where Jesus says that His kingdom reign over the nations (of Psalm 2) is shared with those who belong to Him. In conclusion, as I study the importance of Gen 1:26-28 and see its truths affirmed in both the Old and New Testaments, I am convinced that a proper study of God's kingdom program must grapple with the implications of this passage. It affirms that man is tasked with ruling from and over the earth for God's glory. Yet man failed this task. Other passages tells us that during this age the mandate still exists but is not being fulfilled yet. But when Jesus, the ultimate Man and King returns and establishes the kingdom, then the kingdom mandate will be fulfilled by Him. It will also be participated in by those who identify with King Jesus. This successful reign will be followed by a "Mission Accomplished!" from the Father and the transition to the kingdom of the Father occurs. In a coming blog I will discuss the significance of Gen 1:26-28 in regard to the various millennial kingdom views.